Each year, a jury of German-speaking board game critics evaluates dozens (maybe hundreds?) of board games and produces a list of nominees for the Spiel des Jahres (German for "Game of the Year") award, widely considered to be the most prestigious award in the board gaming world. For nearly 40 years this award has shaped public opinion of board games in Germany and abroad, and over the years two other categories have been added: Kennerspiel des Jahres (Enthusiast Game of the Year), and Kinderspiel (Children's Game of the Year). As a burgeoning hobbyist swept up in the excitement and pomp of these awards, I've tried before to evaluate the list on our YouTube show and in print. It's our hobby's version of the Oscars - I just wish the award ceremony were televised! - and, along with the Origins awards and the Dice Tower awards, forms a triumvirate of accolades that I find deeply interesting. Unlike other awards, the process for deciding the winners of the Spiel des Jahres involves no industry professionals. It's required that jury members be in no way connected to the board gaming industry, and as a consequence their nominations are often surprising. They're also restricted to only those games available in print in Germany (the motherland of our treasured hobby), so often games that are popular in the US aren't eligible yet, or at all. BoardGameGeek, the hobbyist's source for all board gaming information, has in recent years hosted the Spiel des Jahres leaders at a local convention, BGG Spring, and provided a special section of the convention for all of the nominated games. The visiting SdJ folks take the time to teach these games to con-goers, allowing us the chance to experience the games that our German counterparts found to be the best of the year in the various categories. For a full list of past nominees and winners, click here. I played the nominated games at BGG Spring - continue reading for my thoughts! Described by the jury member who taught us, Leo Goes to the Barber is "T.I.M.E Stories for Kids", and it certainly felt that way. Leo, our dashing lion (whose brain seems to be split in twain, ala Inside Out) has 5 days to make it through the jungle and get to Bobo, the simian barber. At the start of each day, players are dealt cards from a deck of 20, each with a number and a color. On each turn, the player plays a card and moves Leo forward a number of spaces towards the barber. Each space is a face-down jungle tile, and there are about 35 tiles in play. The cards are numbered 1-4, of five different colors. When Leo lands on a tile, he stops to chat with the animal there (occasionally a lioness - and though Leo hasn't had his haircut yet, he's still perfectly willing to chat it up with Nala!) and takes up some amount of time. The only way to avoid this is to match the color of the card played with the color of the animal on that tile - which means remembering where the tiles are in each new game. 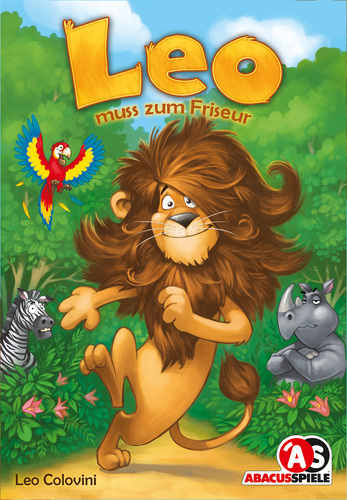 The game comes with a delightful clock with one spinning hand - Leo starts his trek at 8am, and if the clock gets to 8pm before he gets to the barber, he adds some hair to his mane (again, a wonderful little five-piece puzzle of a lion's head, complete with mane). If Leo's hair remains intact, the group has to try again, shuffling and re-dealing the cards to the players and flipping all the tiles face-down again. After five tries, if the group hasn't delivered Leo to the barber, they lose the game. 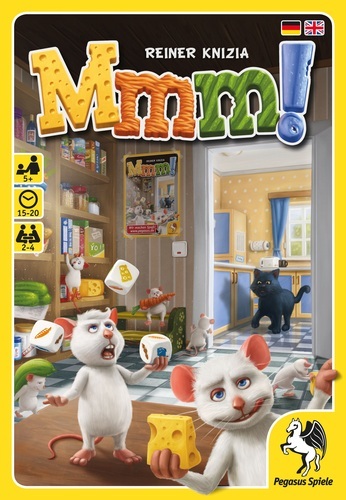 This was our group's favorite of the three kids' games, partially because the memory aspect was fun when shared with a group, and also because the animals were adorable and who can't sympathize with a guy just trying to get his hair cut on a busy day? Mmm! is another cooperative game, this time asking the players to roll dice and steal food before a black cat creeps its way into the kitchen and catches us. It's a Bohnanza-esque game of push-your-luck dice-rolling and strategic token-placing. Each turn, the active player must roll three dice and choose matching food items on the board to "steal" (cover up with a mouse token), hopefully covering up the entire food item so that the cat won't creep closer. Unlike Leo, Mmm! is a cooperative game where players have no hidden information (the hand of cards) and share the exact same decisions, so it's really a one-player board game that multiple people can play. I found the art a little jarring and the game play linear and deeply uninteresting, even though we were playing the advanced variant, which forced us to only play tokens in certain alignments and restricted our choices as the game progressed.  I've got a history of being hit-or-miss on Reiner's games, and this one is definitely a miss. Other than "matching a die result to a space on the board", I'm not sure what skills this is intended to teach children. Also, the art in the game is a little too realistically anthropomorphic for me to get any sense of escapist enjoyment from it. This one wasn't particularly fun or interesting, and it's not something I think I would enjoy playing with kids. 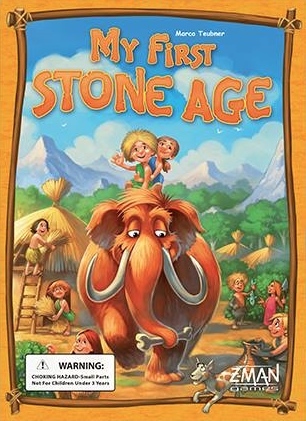 Stone Age, the adult version, is a well-loved gateway worker-placement game in which players compete to expand their families, gather resources, and score points by building huts to expand their tribes. It's an easy-to-learn, fun-to-play game for new and experienced game players alike, and rightfully is recommended often to new entrants to our hobby. For all these reasons and more, our group was really excited to try My First Stone Age, an implementation of the game specifically designed to play with kids. The game looks fantastic on the table. There's a circular track with big wooden resources (pots, fish, arrowheads, mammoth tusks, etc) laid out in their individual spaces, with oversized wooden player meeples and thick cardboard huts with resource costs printed on them. Players have a standing contraption that is meant to hold the huts they build, and the first player to build three is the winner. The game starts with 14 tokens placed face-down around the game board. Some of these correspond to the various spaces on the board (gather resources, take a dog token, trade in the market, build a hut) and some have 1-6 dice pips on them, which simply move a player that many spaces around the board. Each turn, the active player picks a token, flips it face up, and moves directly to the spot on the token. When the "build a hut" token is revealed, that player gets a chance to build a hut, then flips all the tokens face-down and can swap any two. Play continues with the next player, until somebody wins the game. This all sounds simple, and surely 14 tokens isn't so many that you'd easily lose track of where the one building token or the one mammoth tusk you need to finish a building is... but it happens. I LOVE memory games, and used to routinely do the kinds of party tricks that involve looking through a deck of cards, then naming all of them in order with my eyes closed. And yet, I lost track of the building token and almost lost the game because of it. Chris Bryan, Board with Life celebrity and one of the guys in our 4-person group that played all these games together, opined afterwards that for kids, using memory in this way is basically the same as a random draw. I suppose the assumption is that kids probably won't remember all of what's going on, but the challenge of remembering one of two things is enough that it makes them feel challenged and clever at the same time. There's a lot to love about this game, and I would happily introduce it to my cousins or friends with kids. The memory aspects were a little harsh for adults, but for kids who didn't expect themselves to remember everything and then get deeply disappointed when they didn't, I imagine every turn would be a surprise and winning would feel really good. Plus, the component quality is fantastic and just looking at the board is fun. The pieces are also delightful! This is the first time I've critically evaluated kids' games, and it's very clear that the German jury placed a premium on games that encourage memory and problem-solving, as well as component quality. Each of the games had the customary bright colors, cartoon-y art, and graphic simplicity, but some of the choices were surprisingly deep. For instance, My First Stone Age made our table of adult players particularly disgruntled, mostly due to the memory requirements of the game - a sign that we're getting addled in our old age! However, when presented with similar memory requirements in Leo Goes to the Barber, we enjoyed them quite a bit, as the cooperative play meant that we could "share the load" of memorizing the tiles on the board. Of the two, I enjoyed Leo more, because the cooperative play created a shared experience that was really fun, and the fact that we each had a private hand of cards meant that alpha-gaming wasn't really a problem. This Egyptian-themed game of gathering and delivering stones reminded me of a thematic cross between Cleopatra (architects competing in Egypt) and Manila (boats delivering things), but the game play is something very different. Players compete over six rounds to score points by sending boats of stone blocks to various projects - Obelisks, a temple, a pyramid, a burial chamber - or to trade those stones at the market for action and scoring cards. It's a simple game that doesn't take long to teach, and for those of us who grew up with LEGO blocks it produces a special tactile delight when you see the delivered stone blocks grow into tall obelisks or a pyramid-shaped pyramid. Of the three SdJ nominees, this one felt the most like a normal "game" that I'd associate with the hobby, though I didn't find it particularly engaging. I liked seeing the various colored stones grow into the different buildings, and as a designer I have deep respect for when components and mechanics work together to reinforce theme in that way. However, the fact that another player can choose to send a boat full of stones to any location, even a boat that has none of their stones on it, made me feel a distinct lack of control over how well I did in the game. 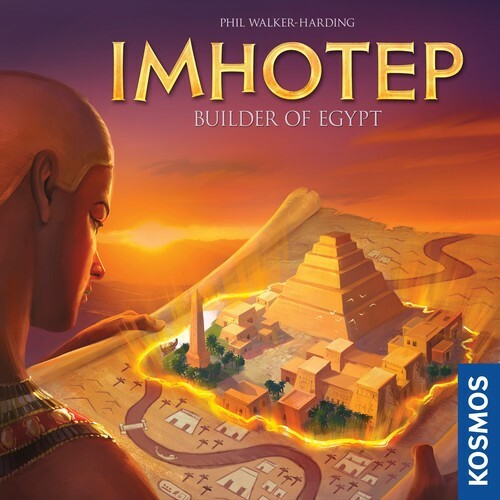 I think with five more plays of Imhotep I'd come to appreciate it a bit more, and I'd be willing to play it more, so in that sense it deserves credit. I'm still surprised it received a nomination, but it's certainly a good game. An SdJ nomination is a huge win for Haba, a publisher best known for creating dexterity-based family games and with a reputation for excellence in that genre. Karuba's nomination is a clear indicator that the German jury considers the word "family" in "family game" to be an important distinction in SdJ judging. 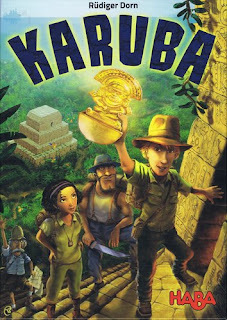 Karuba pits 2-4 players in a race to have their four adventurers cross a jungle and reach their matching-color temples before all 36 jungle tiles have been placed on the board. Each player begins with an identical empty jungle board, with exactly the same randomly-assigned starting locations for all their adventurers and temples. One player draws a random tile each turn, and the other players use the same tile from their player-colored stack of tiles. In this way, all players play exactly the same game - the only randomness is in the order the tiles are drawn. This is reminiscent of Libertalia, a game where players draw identical cards in similar fashion but may choose to use them differently. Tiles can either be placed on the jungle board as paths for adventurers to walk on towards the temples, or discarded to move one adventurer 2-4 spaces, depending on the type of tile. Occasionally, placed tiles will include a gem worth one or two points, and an adventurer who ends movement on that tile collects those points. Each time a player's adventurer reaches the temple matching the adventurer's color that player takes the next available scoring marker for that color (5, 4, 3, or 2 points), and play continues until all 36 tiles have been drawn or one player has reached all four of their temples. Karuba got a lot attention in my local game group, and is their underdog/emotional favorite to win the award. I found that I enjoyed being the "barker", the player calling out the random tile each turn. Aside from that, I think it's a cute, puzzle-y game that I'd grow tired of after a few plays. The components are excellent, fully in line with Haba's reputation. In many ways, Karuba is the game I wanted when I bought Days of Wonder's 2013 release, Relic Runners. It does seem great for kids, and as a gateway might be a wonderful introduction to the hobby for a family that enjoys doing puzzles together. Parents and kids might enjoy simply playing with one board, and cooperatively working to "solve the puzzle" and use tiles to either build paths or move adventurers, with a goal of getting to all four temples before all 36 tiles are used. 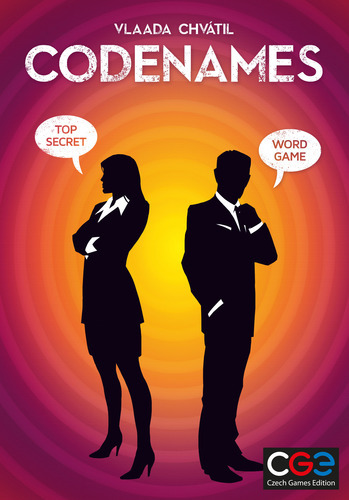 In Codenames, two "spymasters" compete to give secret clues to their teams of spies to help them identify other field agents before the other team does the same. The game has a theme (spies) that briefly resonates with players, but in my experience is lost the moment play begins. It's a party game of giving and receiving clever single-word clues, with the goal of finding the right words in a larger set of words so that your team wins. If that doesn't sound incredibly engaging, it's ok - explaining how to play Codenames is the only part of it that isn't a master class in genre-defining excellence. Simply put, Codenames is the best party game I've ever played. The pressure as spymaster to give clever clues that link only to your words, link to as many of them as possible, are likely to be interpreted correctly by your teammates, AND don't cause them to choose the assassin (an automatic loss) is intense, and remains as satisfying after 100 plays as it did in the first. As I said earlier this year, Codenames is a game that I would keep even if I had to get rid of all the others. The components are cleverly designed so as to create practically unlimited replayability, as flipping over one word card or rotating one codex card creates a completely new game. If it weren't for Pandemic Legacy, this would be a shoo-in for my "Spiel des JR" award from 2015. It's great. If you haven't played it, you're missing out on one of the best games I've ever played. It's $20 MSRP and you can play it with anybody clever enough to give and receive one-word clues, i.e., everybody. I've played it with family at the most casual of holiday gatherings and with other game designers, and in each situation it was a huge hit. Codenames is my favorite party game I've ever played, and of all the games from 2015 it's the one most likely to be in my collection 30 years from now. My game at BGG Spring was my 100th logged play since last fall, and I still get excited when it hits the table. I'm surprised it's nominated for Spiel des Jahres only because I'm not sure everybody appreciates the strategic and tactical nuance that's discovered after dozens of plays, but clearly the judges know a great game when it hits their table. 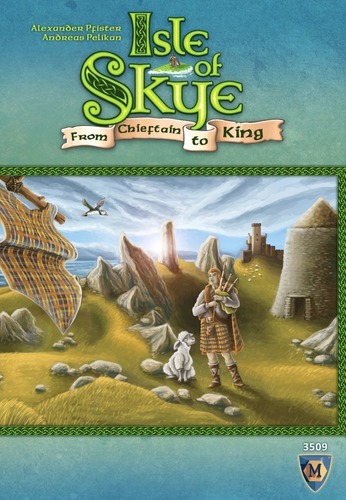 I'd played Isle of Skye before, and remembered really enjoying it. It feels like a great designer sat down with Carcassonne after a decade of enjoying it and said "how can I use these tiles to play a deeper, more engaging game?" Players are enterprising chieftains pursuing kingship, competing to score the most victory points by meeting a mix of four different randomly-selected scoring criteria over six rounds of play. Each round, players draw three tiles from a bag and secretly choose two to put up for sale and one to return to the bag. Players choose to put a price on the tiles for sale, and must use the gold they have to indicate prices, while saving some to possibly buy a tile from another player as well. Having to divvy up gold in three ways (tile one, tile two, and saving some to buy with) is really engaging, and immediately sets Isle of Skye apart from other tile-based games I've played. Scoring happens at the end of each round, during which a mix of two or three of the four scoring criteria are used. Each of the four scoring criteria are used three times during the game, though some happen mostly in the first few rounds and some in later rounds. This creates a sense of timing for players to pursue the different priorities, and, combined with fluctuating available gold, random tile draws, and turn order, leads players to pursue different paths to victory. Isle of Skye is a masterpiece, and in any other year I'd say it deserved to win. Unfortunately, it had the bad luck of getting nominated with two of the most innovative games I've ever played, something the jury apparently takes to heart. Even so, I fully recommend it to any enthusiastic gamer looking for something new to fall in love with. The number of different scoring criteria, the randomness of the scoring elements on the tiles, and the general gameplay mean no two games will ever be the same. You could play this game dozens of times and have a different, excellent experience with each. I didn't actually play T.I.M.E Stories at BGG Spring, but I did play it at BGG.Con last fall and afterwards. Unlike every other game on this list, and perhaps every other game ever, T.I.M.E Stories is less a game and more a console. Buying it is like buying a Super Nintendo - yes, it comes with a game, but what you're really buying is a box that will let you play lots of other games that are being developed for this system. I've played "Asylum", the case that comes in the box. In it, players act as newly-recruited "temporal agents" sent back to an Asylum to stop some kind of evil ritual. In the interest of spoilers I won't talk more about the story, or even much about the game play. It's brilliantly designed, in that you simply unbox the game, put the board on the table, and read the top card in the stack you're given. The cards teach you how to play as you flip through them, much like the "onboarding" experience you get in an app or video game. While I didn't particularly enjoy the Asylum case, I do marvel at the innovation and precision needed to create a system where many different designers can design simple decks to tell all sorts of different stories though this mechanism. I wouldn't be surprised if it won the Kennerspiel, though I think the game included in the box was less fun than the other two nominated games. 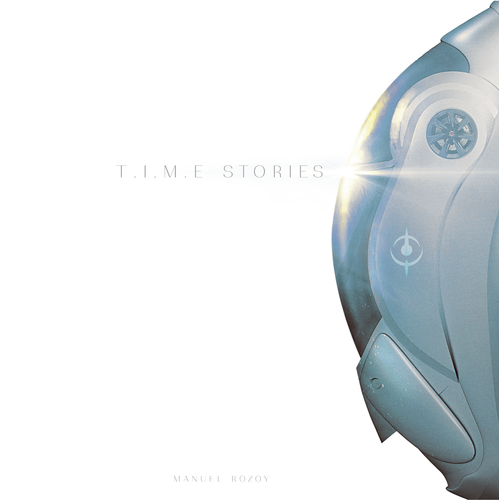 The T.I.M.E Stories module I played felt like a puzzle combined with an RPG, and as players we had to choose early on which of those experiences it was going to be for us. We never really reached consensus, and that damaged the experience for me, as there was real friction between "do we try to beat the game as efficiently as possible" or "do we play our characters as narratively as possible". Admittedly, this had a lot to do with the group I played with, and I'm looking forward to trying new modules in the hopes that I have a better experience later. This is not only my favorite game from 2015, but perhaps the best gaming experience I've ever had. 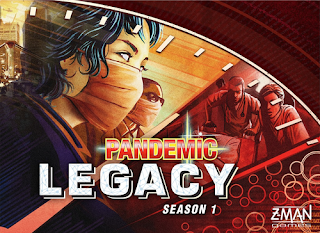 I'm not a big fan of Pandemic (I'm an alpha gamer living in a beta world), and playing a cooperative game with my wife is usually asking for tension and stress, but we both loved Pandemic Legacy. It's impossible to talk about this game for very long without risking spoilers, so I'll simply say that it's a must-play for anybody who enjoys games. The "Legacy" mechanic has gotten a lot of attention over the past few years, and rightfully so - the idea of creating permanence by destroying or altering game components creates a deep emotional response in many players. For those of us used to saving before we try a hard level in a video game, the thought of not being able to "take back" something in a campaign-based game seems strange, and when it involves destroying a component in an $80 board game it's almost sacrilegious. Surprisingly, destroying components was cathartic, and the thought of "we can't turn back now" was really exciting and motivating. Amy and I played 4 games of Pandemic (to prepare) and 6 games of Pandemic Legacy the first day we opened the box. It literally left us breathless at times. I fully recommend Pandemic Legacy to any group looking for a wonderful gaming experience that will last at least a few months. We played with only two players, which makes for an "easier" game, but still found it to be obsession-level fun. I've heard that it's just as good with three or four, so get a group and get going! The Kennerspiel award is for "enthusiast" or "connoisseur" games, those games hobbyists tend to think of as being "gamer's games", or that I think of as "games I'm playing this week". This is the first year that a Legacy game has been nominated, and I expect that trend will continue as more designers approach the mechanic. I spoke with one of the jury members on site at BGG Spring, and he told me that the award is intended to recognize innovation in game design, and so T.I.M.E. Stories and Pandemic Legacy were considered favorably. Of these two, Pandemic Legacy is my clear preference - it was the best gaming experience I had in 2015. This is the first year that I've been able to play all the nominated games before the awards were announced, and the first time I've reviewed them in this format. Simply playing them all has been great, and sitting down to critically think about them against each other has lent a perspective I didn't have before - that of a jury member trying to decide between rewarding a simple experience or an engaging one, a familiar experience or a novel one. It's difficult and thrilling and makes me feel more deeply connected to a hobby that's already changed my life in so many ways. I hope you get a chance to try these games as well. Happy gaming!